​Goals from Jaime Santos and Jobbie Justin handed East Bengal a priceless 2-0 win over arch-rivals Mohun Bagan ​in the second Kolkata derby of the season in the I-League. Enrique Esqueda was brought back into the East Bengal match day squad. However, Alejandro Menendez decided to keep him on the bench at the start of the game. Pintu Mahato came in place of Azharuddin Mallick in Bagan's right wing position after an injury layoff of almost two months. Lalrindika Ralte, on the other hand, replaced suspended Manoj Mohammad in East Bengal's left-back position. The game started with East Bengal on the front foot and they looked like the team that came out the more determined of the two sides on the day. Their attacking mentality and quick movement was what led to them scoring the first goal of the game in the 35th minute. Jaime Santos Colado scored the opening goal for East Bengal. Jobby Justin beat Kingsley on the right flank and put in a low ball inside the box for Jaime. The Spaniard dribbled past Gurjinder and slotted the ball home to give Bengal a deserved 1-0 lead, which they held on to for the rest of the first half. The second half began on an aggressive and physical note as both teams indulged in some rough play in what was turning out to be a proper derby clash. In the 51st minute, Jaime Santos was lucky not to be shown a red card as he held Dipanda by his neck after the striker's tussle with Johnny Acosta inside the box. 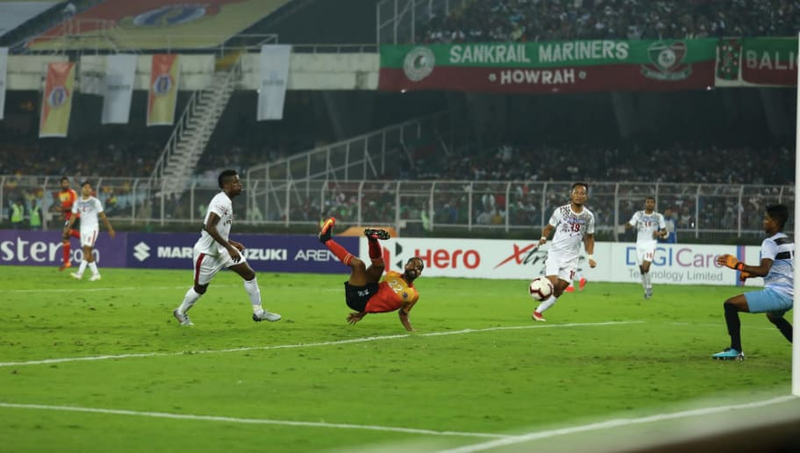 East Bengal held on to their one goal advantage comfortably and they were rewarded with a second goal 15 minutes before time courtesy Jobby Justin, who slotted a clean header past the Bagan goalkeeper from Didika's corner. The Red and Golds strolled past the final 15 minutes of the clash and earned a deserved three points which took them into the top four of the I-League table.